Members of the Jaudy family are making a gift to establish the Robert L. Martuza, MD, Endowed Scholar in Neurosurgery. Pictured, from left, are Helena L. de C. Jaudy, Rachid Jose Jaudy, Helena Jaudy, Bob S. Carter, MD, PhD, and Robert L. Martuza, MD. When Brazilian finance manager Helena Jaudy learned she had a brain tumor behind her right ear, she searched the world for the best possible doctor. She found several — at Massachusetts General Hospital. Thousands of international patients from more than 140 countries travel to Mass General seeking medical care, a second opinion, or treatment unavailable in their home countries. What followed was two years of care at Mass General, including brain surgery to remove the tumor. Now tumor free, Helena and her family are providing a $1 million endowment to establish the Robert L. Martuza, MD, Endowed Scholar in Neurosurgery in honor of Dr. Martuza, the recently retired chief of Neurosurgery who cared for her. Her brain surgery was performed by Dr. Martuza’s successor, Bob S. Carter, MD, PhD. Helena says patients from other countries should not hesitate to seek care at Mass General, which offers world-class treatments and guidance for international patients. Thousands of international patients from more than 140 countries travel to Mass General seeking medical care, a second opinion or treatment unavailable in their home countries. 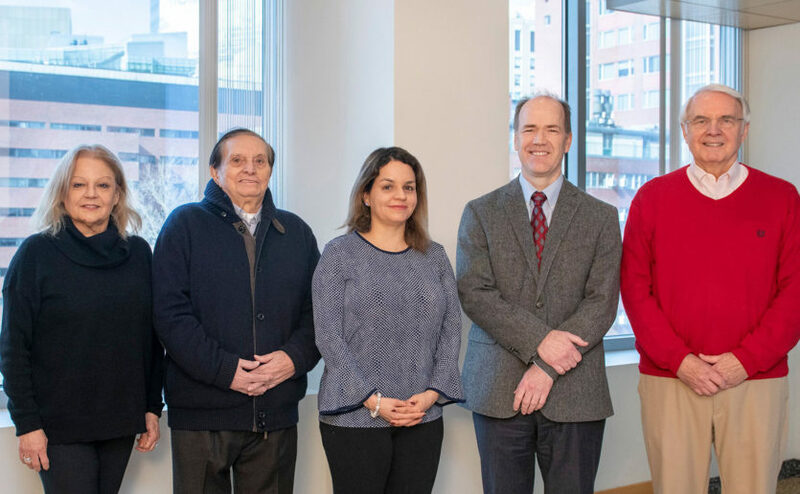 The International Patient Center helps guides patients through the process of making appointments with specialists who are faculty members at Harvard Medical School. Mass General is home to highly ranked programs in cancer treatment, neurology, neurosurgery, heart disease, orthopedics transplantation surgery, urologic disease, trauma care and more. Helen Jaudy (center) is grateful to her Mass General neurosurgeons, Bob S. Carter, MD (left), and Robert L. Martuza, MD. In 2016, Helena was visiting her dentist near home in Sao Paulo, Brazil when an injection of pain-relief medication triggered headaches, dizziness and other symptoms that wouldn’t go away. An MRI in Brazil revealed a common type of non-malignant brain tumor known as meningioma. Meningioma is not usually cancerous, but it sometimes grows, causing symptoms and possible brain damage. Helena visited several doctors in Brazil but was not satisfied with the medical care she received and wanted a second opinion. “They told me not to worry. But I was very worried,” she recalls. “I had a tumor in my brain.” Her headaches and dizziness continued. Having spent time in Boston as a student and as an intern, she knew that Mass General was a highly-ranked research hospital and she began searching online for help. She found Dr. Martuza. A renowned brain researcher and compassionate clinician, Dr. Martuza’s research had helped identify the genetic changes that occur in meningioma. He also led the team that invented the first use of genetically-engineered viruses to treat cancer— known as oncolytic viruses. Helena came to Boston where Dr. Martuza carefully monitored her tumor and helped her find other specialists who successfully treated her headaches and dizziness. They included neurologists Andrew Cole, MD, and David Chen, MD. When Dr. Martuza retired from patient care, Dr. Carter became Helena’s neurosurgeon. After months of monitoring, he saw that her tumor had begun to grow. “We have entered an era of more personalized approaches,” says Dr. Carter, explaining that Helena’s tissues underwent “snapshot analysis” at the Mass General Department of Pathology, which identified the molecular pathways that were affected in her brain. Helena and Dr. Carter decided to proceed with surgery to remove the meningioma tumor in 2018. The surgery went smoothly. “They opened my skull and closed it up and I didn’t feel anything,” she recalls. Her symptoms are gone now and so is the tumor. There is a small chance it may recur, so she will stay in touch with her specialists at Mass General and in Brazil. Helena and her parents, Rachid Jose Jaudy and Helena L. de C. Jaudy, are making a $1 million gift to support the establishment of the Robert L. Martuza, MD, Endowed Scholar in Neurosurgery to pursue meningioma research. It is the first-ever substantial gift to meningioma research. It is an underfunded area of research, Dr. Martuza says. “Meningioma can recur in a very aggressive way.” The genetics of meningioma have been defined but few treatments have been developed. “This gift will open up new avenues of research including new strategies for understanding meningioma tumors, why they form, and how we can better treat them,” Dr. Carter says. One of these avenues is the oncolytic virus therapy which Dr. Martuza invented. With her health restored, Helena and her husband, Edson Rezende, who were pursuing fertility treatments with Jill Attaman, MD, at the Mass General Department of Obstetrics and Gynecology, have decided to start a family in Brazil. To learn more about meningioma treatment or research, or to make a donation please contact us.